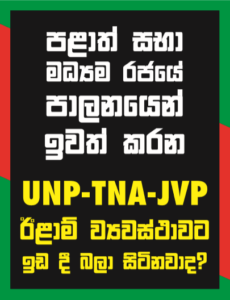 Chandrika Kumaratunga’s memorial lecture on S. J. V. Chelvanayakam (April 25th, 2015) should be taken seriously not because she claims to be “a political scientist” (she did so in her first TV interview after she succeeded in her plot to overthrow of the Mahinda Rajapaksa regime) but because it is loaded with a political message on the critical issue of majority/ minority relations – the most infectious and inflammatory issue exploding in diverse parts of the globe threatening peace and stability. The majority vs. minority issues can vary from the sexual orientation of gays, to wearing the hijab in France, to Sunni vs. Shite in the Middle East, to xenophobic attacks on migrants in S. Africa, to majorities demanding conformity from minorities, to minorities demanding special privileges on top of what is available in common with others, the plight of the Sephardic Jews dominated by Euro-centric Ashkenazis in Israel, the persecution of Afro-Americans even after Abraham Lincoln passed the Emancipation Act in 1863, (111 were killed by the white Police in America in March 2015 alone) etc. In broad outline, the underlying issues boils down to violent explosions that threaten the peaceful co-existence of the two demographics.